Even though the Kremlin sees the visits of high-ranking U.S. officials as a sign of diplomatic progress, Russian and American experts remain skeptical. They point to the significant differences that still exist in how Russia and America view the world. 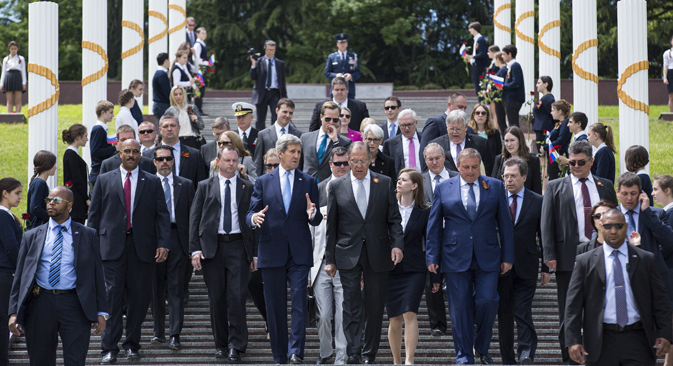 Shortly after the May 12 visit of U.S. Secretary of State John Kerry, experts were both optimistic and pessimistic about its impact on U.S.-Russia bilateral relations, with many welcoming Kerry’s negotiations with Russian Foreign Minister Sergei Lavrov and President Vladimir Putin as a good sign. Likewise, the visits of other high-profile U.S. officials – U.S. Assistant Secretary of State Victoria Nuland and U.S. Special Envoy for Syria Daniel Rubenstein – were greeted and viewed as an attempt to restore the damaged relations with Moscow and resume talks on the thorniest issues. However, Russia’s Foreign Ministry tends to interpret the visits by Kerry and Nuland as a victory of Russian diplomacy. These negotiations indicate that “attempts to isolate Russia failed,” said Lavrov during a business lunch at Rossiyskaya Gazeta’s editorial office on May 18th. He also pointed out that there are many international challenges – from Ukraine to Syria and Yemen – that are impossible to resolve without the involvement of Russia. Lavrov regards Kerry’s visit as a “responsible” step in tackling regional conflicts and helping to end the standoff in U.S.-Russia relations. During the May 18 lunch with journalists, Lavrov admitted that restoring trust between Moscow and Washington would be very difficult, given their different interpretations of the details of the Minsk II Agreements. Likewise, some Russian and American experts warn against being over optimistic regarding Kerry’s and Nuland’s visits and argue that it does not necessarily mean that Russia and the U.S. have passed a historic low in their relations. Matthew Rojansky, director of the Wilson Center’s Kennan Institute, is also very skeptical, because Russia and the U. S. are “still very far apart on the core dispute over Ukraine.” He highlights that the official positions of the Kremlin and the White House remain very different, with the Russian side focusing on the U.S. coming back to the table to seek the “normalization” of ties with Russia and realizing that it cannot get very much done without Russia’s partnership. “From the U.S. side it was almost the opposite – sending top diplomats to remind Russia that its past and ongoing bad behavior is unacceptable and [to] underscore why Russia simply must cooperate with the West on Syria and Iran, which the U.S. describes as being ‘in Russia’s interest,’” Rojansky said. U.S. President Barack Obama is personally against sending weapons and, like Germany’s Chancellor Angela Merkel, he understands the extremely negative implications of such a risky move. However, the U.S. Congress has already authorized sending weapons with a veto-proof supermajority in the case of a major increase in violence in eastern Ukraine. “His only way forward is to show that he has done everything he can diplomatically even if in the end he authorizes even a symbolic weapons delivery. If that does happen, the conflict will of course become even more intractable with greater casualties on both sides,” Rojansky said. Why did John Kerry really come to Russia? Is his visit a game-changer? Will Moscow and Washington find a compromise? Read the full story at Russia Direct.